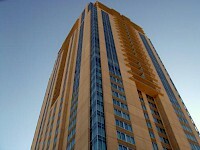 The Westin Virginia Beach Town Center is a 38 story high rise hotel and living residence in Virginia Beach Town Center. The 4 star hotel is the bottom half of the 38 story building and the upper stories are the residents' homes. There are 119 condominiums in the top floors ranging from 900 to 4,000 square feet. The building was built throughout 2006 and 2007. Upon completion, it became the tallest building in Virginia, surpassing the James Monroe Building in Richmond.